Note: This document uses examples and implementation in Cisco IOS® in order to illustrate the various behaviors that can be encountered. The sections that follow describe some of the most common EIGRP issues and some tips about how to troubleshoot the issues. You can see in the output that the first neighbor has a problem, and the Uptime is reset. It is important that you verify whether the process router EIGRP has the eigrp log-neighbor-changes command. However, this is included by default since Cisco bug ID CSCdx67706, so it does not show up in the configuration in that case. Check the entry in the logs for both of the EIGRP neighbors on each side of the link. In at least one of the logs, there should be a meaningful entry. Note: This only occurs in older code versions. There is no neighbor flap since Cisco bug ID CSCdp08764. Refer to the SIA section of this document. An expired holding timer indicates that the router did not receive any EIGRP packet (that is, an EIGRP Hello or any other EIGRP packet) during the hold-time interval. There is more than likely a problem on the link in this case. Check that the router receives the EIGRP Hello packets on this link and that the other side sends them. In order to verify this, enter the debug eigrp packet hello command. As an alternative to the use of the debug command, you can ping IP address 224.0.0.10 and verify whether that neighbor replies. Possible causes for the multicast problem on the link are due to interface problems, such as if an intermediate switch blocks the EIGRP Hello packets. Another quick test that you can perform is to try another protocol that uses another multicast IP address. For example, you can configure Routing Information Protocol (RIP) Version 2 that uses the multicast IP address 224.0.0.9. The reliable EIGRP packet was retransmitted at least 16 times. A packet is retransmitted every Retransmit Time Out (RTO). The minimum RTO is 200 ms and the maximum is 5,000 ms. The RTO increases or decreases dynamically via observation of the time difference between the time that the reliable EIGRP packet is sent and the time that the acknowledgement is received. When the reliable packet is not acknowledged, the RTO increases. If this persists, then the RTO increases up to five seconds quickly, so the retry limit can reach 16 x 5 seconds = 80 seconds. However, if the EIGRP hold time is larger than 80 seconds, the neighborship does not go down until the hold time has expired. This can occur on slow WAN links where, for example, the default hold time is 180 seconds. For links with hold times lower than 80 seconds, this effectively means that if the hold time does not expire, it is kept up by the EIGRP Hello packets. The retry limit can then be exceeded. This indicates that there is either an MTU problem or a unicast problem. The EIGRP Hello packets are small; the (first) EIGRP Update packet can be up to full MTU. It will be full MTU size if there are enough prefixes to fill the update. The neighbor can be learned via the reception of the EIGRP Hello packets, but full adjacency might not succeed if the EIGRP Update packet is not acknowledged. Note : As of Cisco bug ID CSCsc72090, the EIGRP also uses the IP MTU settings of the interface. Before this fix was applied, the EIGRP packets would become fragmented if the IP MTU was configured with a value that was lower than 1,500. This issue can typically occur in Dynamic Multipoint VPN (DMVPN) networks. A second possibility is that the EIGRP Hello packets make it because they are multicasted to IP address 224.0.0.10. Some EIGRP Update packets might make it, as they can be multicasted. However, retransmitted EIGRP reliable packets are always unicast. If the unicast data path to the neighbor is broken, the retransmitted reliable packet does not process properly. Ping the EIGRP neighbor unicast IP address (with the size of the ping set to the full MTU size of the link, and with the Do Not Fragment bit (DF-bit) set) in order to verify. A one-way link can cause this problem as well. The EIGRP router might receive the EIGRP Hello packets, but the packets that are sent from this neighbor do not make it across the link. If the Hello packets do not make it, the router is unaware because the Hello packets are unreliably sent. The EIGRP Update packets that are sent will not be acknowledged. Note: There is always one or more packets in the queue (Q Cnt). As shown in the output, R2 awaits the first Update packet (init bit set) from the neighbor at IP address 10.1.1.1. In this next output, R2 awaits the acknowledgement of the first Update packet (init bit set) from the neighbor at IP address 10.1.1.1. Note: The RTO is at its maximum of 5,000 ms, which indicates that the EIGRP reliable packets are not acknowledged within the five seconds. Note: The retry value increases, the Flags value is 0x1, and the Init bit is set. If you observe a peer restarted repeatedly on one router, it indicates that the router receives the initial Update packets from its neighbor. Be aware of the Flag 1 in the received Update packets. If this occurs once after a neighbor flap, then this situation is not a problem. However, if you experience it often, it indicates that the unicast on the link is operational, but the multicast on the link is broken. In other words, the router receives the unicast Update packet, but not the Hello packets. These issues are explained in greater detail in the sections that follow. Note: The results of the commands that are used throughout this section are the same if you configure the negation instead (the no command). Note: The same occurs when you configure a distribute-list <> in as well. In this case, only the EIGRP neighborships on this interface are reset. Note: After Cisco bug ID CSCdy20284, the neighborships are not reset for manual changes such as summarization and filters. There is a 32-bit Flags field in the EIGRP packet header, and it is useful to understand the indications of the various Flag values. This Flag is set in the initial Update packet. This Flag indicates Conditional Receive mode (CR-mode). This is a part of the reliable EIGRP multicast process and is used in order to allow the neighbors who have not acknowledged a previous reliable packet to catch up on a shared link. The addresses in the Sequence Type Length Value (TLV) are the peers who should ignore the multicast packets until they catch up via unicast packets. This Flag is the Restart bit (RS bit). It is set in the Hello packets and the Update packets when NSF is signaled. An NSF-aware router views this bit in order to detect if the neighbor router restarts. The neighbor that detects then knows to keep up the EIGRP adjacency. The router that restarts views this Flag in order to determine whether the peer helps with the restart. This is the End-of-Table (EOT) bit. This bit indicates that the complete routing table has been sent to the neighbor. An NSF-capable router views this bit in order to determine whether the neighbor router has completed its restart. An NSF-capable router waits for this bit before it removes stale routes from the router that restarts. The Flags are printed in one HEX number. Thus, Flag 0x5 means that Flags 4 and 1 are set; Flag 0x9 means that Flags 8 and 1 are set; Flag 0xA means that Flags 8 and 2 are set. ping with "verify reply data"
This section provides an overview of the SIA state, some possible symptoms and causes, and how to troubleshoot it. The SIA state means that an EIGRP router has not received a reply to a query from one or more neighbors within the allotted time (approximately three minutes). When this occurs, the EIGRP clears the neighbors that do not send a reply and logs a DUAL-3-SIA error message for the route that went active. If this only occurs sporadically, it can be ignored. If it occurs frequently, it indicates a persistent network problem. View the prefixes that are consistently reported as SIA and determine the commonalities. Locate the router that consistently fails to answer queries for these routes. Determine whether all of the prefixes for which SIA is reported have commonalities. For example, they all might be /32 routes from the edge of the network (such as in dial-up networks). If so, it might indicate the problem location in the network (namely, where these prefixes originated). Ultimately, you must discover the location where one or more routers sends queries and does not receive replies, while the downstream router is not in this state. For example, the router could send queries and they are acknowledged, but the reply from the downstream router is not received. You can use the show ip eigrp topology active command in order to help troubleshoot the SIA issue. Look for the small r in the command output. This means that the router awaits a reply to a query for that prefix from that neighbor. Here is an example. View the topology. The links R1-R6 and R1-R5 are shut down. When the loopback interface of the router R1 is shut down, R1 sends a query for the prefix 10.100.1.1/32 to R2 and R3. The router R1 is now active for this prefix. The routers R2 and R3 go active and query in turn the router R4, which goes active and sends a query to R5. The router R5 finally goes active and sends a query to R6. The router R6 should return a reply to R5. The router R5 goes passive and replies to R4, which in turn goes passive and sends a reply to R2 and R3. Finally, R2 and R3 go passive and send a reply to R1, which goes passive again. If a problem is encountered, then a router can stay active for an extended time, as it must wait for a reply. In order to prevent the router waiting for a reply that might never be received, the router can declare SIA and kill the neighborship through which it awaits the reply. In order to troubleshoot the problem, view the show ip eigrp topology active command output and follow the trail of the r.
%DUAL-3-SIA: Route 10.100.1.1/32 stuck-in-active state in IP-EIGRP(0) 1. When you view the output for router R5, you can see that there are problems on the link towards R6. This is new SIA code, and as such, the SIA occurred on a router that was next to the problem. In this example, this is the link between the routers R5 and R6. In older code versions, the SIA could be declared on any router along the path (such as on R2), which might be distant from the problem. The SIA timer was three minutes. Any router along the path could be the first to go SIA and kill the neighborship(s). With the newer code, the router awaits a reply, intermediately sends an SIA query to its neighbor, and the neighbor immediately answers with an SIA reply. For example, while in the active state, the router R4 sends an SIA query to R5, and R5 replies with an SIA reply. The router R5 also sends SIA queries to R6, but it does not receive an SIA reply from R6. Apply summarization (manual or automatic) in networks with many prefixes or a deep query range. Use distribute-lists in order to decrease the query range. Define remote routers as stubs. There are two types of missing prefixes: those that are missing in the routing table (or Routing Information Base (RIB)), and those that are missing in the topology table. The prefix is installed in the routing table by another routing protocol with a lower administrative distance. A distribute-list blocks the prefix. A split-horizon blocks the prefix. In this example, the prefix is installed in the routing table by a static route or a routing protocol with a lower administrative distance. Typically when this occurs, the prefix is in the topology table but has no successor. You can view all of these entries with the show ip eigrp topology zero-successors command. The Feasible Distance (FD) should have an infinite value. The EIGRP is a distance-vector routing protocol. You can use a distribute-list on any router in order to block prefixes. You can use it on an interface in order to stop the prefixes from being sent out or being received, or you can configure the distribute-list globally under the router EIGRP process in order to apply the routing filter on all of the EIGRP-enabled interfaces. This section describes some of the reasons that a prefix might be missing from the topology table. As shown, the prefix is present in the topology table. This section describes another common mistake. EIGRP is not a link-state routing protocol, but rather it is a distance-vector routing protocol. The topology table must be used for the correct operation of Diffuse Update Algorithm (DUAL), not because the EIGRP is a link-state routing protocol; hence, it requires a database. The topology table is required because only the best routes are installed in the routing table, while the DUAL demands that the feasible routes are monitored as well. These are stored in the topology table. You should always have the successor route and the feasible routes in the topology table. If not, there is a bug. However, there could also be non-feasible routes in the topology table, as long as they are received. If they are not received from a neighbor, there could be a split-horizon that blocks the prefix. The output of the show ip eigrp topology command shows only the prefix entries that point to successors and feasible successors. If you want to view the prefixes that are received over all of the paths (also non-feasible paths), then enter the show ip eigrp topology all-links command instead. Consider the last prefix in the previous output; the path via 10.4.1.5 has (2323456/2297856). The reported distance (advertised metric) is 2297856, which is not smaller than the FD of 2297856, so the path is not feasible. This is because the router R1 never received the prefix 192.168.100.6/32 via R2 or R3, as they have the prefix 192.168.100.6/32 via R1 in the routing table. In order to verify this, use the all-links keyword on R1 when you view the topology table. This shows all of the paths for all of the prefixes, which includes the non-feasible paths. You can then see that the prefix 192.168.100.6/32 has not been learned by the router R1 from R2 or R3. Note: The MTU and hop count are not included in the metric calculation. Note: The delay is measured in tens of microseconds; however, on the interface, it is measured in microseconds. The delay is cumulative, which means that you add the delay of each link along the path. The bandwidth is not cumulative, so the bandwidth that is used in the formula is the smallest bandwidth of any link along the path. The EIGRP router ID is not used at all for internal routes in older Cisco IOS versions. A duplicate router ID for the EIGRP should not cause any problems if only internal routes are used. In newer Cisco IOS software, the EIGRP internal routes do carry the EIGRP router ID. If an (external) EIGRP route with the same EIGRP router ID as the router is received, it does not generate a log entry. However, the EIGRP event log does capture this. When you check for the (external) EIGRP route, it does not show up in the topology table. The message indicates that the EIGRP neighborship is not established because of a mismatch in K-values. The K-values must be the same on all of the EIGRP routers in one autonomous system in order to prevent routing problems when different routers use different metric calculations. This is the same message as in the case of a true K-values mismatch on the neighbor routers. The no router eigrp command is entered. The no network command is entered. The clear ip eigrp neighbor command is entered. A graceful shutdown is used in order to speed up the detection of a neighbor down state. Without a graceful shutdown, a neighbor must wait until the hold time expires before it declares the neighbor to be down. Unequal cost load balancing is possible in EIGRP with the variance command, but both the variance and feasibility conditions must be met. The router R1 has a variance 2 configured. This means that if the router has a another path for the route with a metric that is not larger than twice the best metric for that route, there should be unequal cost load balancing for that route. If the second topology entry is installed in the routing table, the metric of the second topology entry is 435200. Since twice the best metric is 2 x 409600 = 819200, and 435200 < 819200, the second topology entry is within the variance range. The reported distance of the second topology entry is 409600, which is not smaller than the FD = 409600. The second condition (feasibility) is not met, and the second entry cannot be installed in the RIB. If the RD of the second topology entry is smaller then the FD, as in the next example, there would be unequal cost load balancing. The EIGRP supports configurations with one or more static neighbors on the same interface. As soon as you configure one static EIGRP neighbor on the interface, the router no longer sends the EIGRP packets as multicast on that interface or processes the received multicasted EIGRP packets. This means that the Hello, Update, and Query packets are now unicasted. No additional neighborships can be formed unless the static neighbor command is explicitly configured for those neighbors on that interface. EIGRP: Multicast Hello is disabled on Ethernet0/0! You want to limit or avoid broadcasts on Non-Broadcast Multi-Access (NBMA) networks. You want to limit or avoid multicasts on broadcast media (Ethernet). For troubleshooting purposes (using unicast instead of multicast). Caution: Do not configure the passive-interface command together with the static EIGRP neighbor command. When you configure a static route that points to an interface, and the route is covered by a network statement under the router EIGRP, then the static route is advertised by the EIGRP as if it were a connected route. The redistribute static command or a default metric is not required in this case. Caution: Do not use reliability and/or load in order to calculate metrics. The reliability and load parameters appear in the show interface command output. There are no dynamic updates for these parameters when the load and reliability change. If the load and reliability change, it does not trigger an immediate change in the metric. Only if the EIGRP decides to send updates to its neighbors because of topology changes will the change in load and reliability be propagated. Furthermore, use of load and reliability in order to calculate the metric can introduce instability, as adaptive routing is then performed. If you desire to change the routing in accordance with the traffic load, then you should consider the use of Multiprotocol Label Switching (MPLS) traffic engineering or Performance Routing (PfR). Router âÂÂ This process holds the shared memory pools. Hello âÂÂ This process sends and receives the Hello packets and maintains the peer connections. Maintains the neighbor and topology tables of the EIGRP routers that belong to that protocol suite. Builds and translates protocol-specific packets for DUAL (transmission and reception of EIGRP packets). Interfaces DUAL to the protocol-specific routing table. Computes the metric and pass the information to DUAL (DUAL only picks the successors and feasible successors). Performs redistribution functions to and from the other routing protocols. High CPU in the EIGRP is not normal. If this occurs, either the EIGRP has too much to do or there is a bug in EIGRP. In the first case, check the number of prefixes in the topology table and the number of peers. Check for instability among the EIGRP routes and neighbors. In frame relay networks where there are multiple neighbor routers on one point-to-multipoint interface, there can be many broadcast or multicast packets that must be transmitted. For this reason, there is a separate broadcast queue with its own buffers. The broadcast queue has priority when it transmits at a rate below the configured maximum and has a guaranteed minimum bandwidth allocation. N/4 times the minimum remote access rate (measured in bytes per second), where N is the number of DLCIs to which the broadcast must be replicated. One quarter of the local access rate (measured in bytes per second). If you observe a large number of EIGRP neighbors flapping, increase the frame-relay broadcast-queue size. This issue is not present if there are frame relay subinterfaces because each neighbor router is on one subinterface with a different IP subnet. Consider this as a workaround when there is a large, fully-meshed frame relay network. When you enter the debug eigrp packets hello command, it reveals that the router does not receive the Hello packets. As shown, the routers R1 and R3 have auto-summary under router EIGRP. The router R2 receives 10.0.0.0/8 from both routers R2 and R3 because both R2 and R3 are boundary routers between major class A network 10.0.0.0/8 and 172.16.0.0/16. 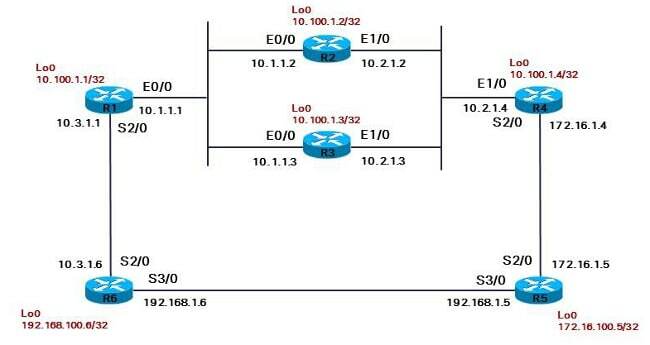 The router R2 can have the route 10.0.0.0/8 via R1 and R3 if the metric happens to be the same. Otherwise, R2 has the route 10.0.0.0/8 either via R1 or via R3, dependent upon the path that produces the least cost. 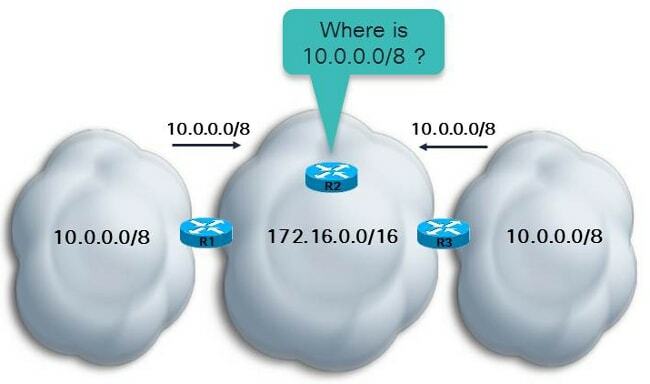 In either case, if R2 must send traffic to certain subnets of 10.0.0.0/8, it cannot be completely sure that the traffic reaches its destination, as one subnet of 10.0.0.0/8 can be only on either the left or the right network cloud. In order to alleviate this problem, simply type no auto-summary under the router EIGRP process. The router then propagates subnets of the major networks across the boundary. In newer Cisco IOS versions, the no auto-summary setting is the default behavior. The EIGRP event log captures the EIGRP events. It is similar to when debugs are enabled for EIGRP. However, it is less disruptive and runs by default. It can be used in order to capture events that are more difficult to troubleshoot or more intermittent events. This log is by default only 500 lines. In order to increase it, enter the eigrp event-log-size <0 âÂÂ 209878> command. You can increase the log size as much as desired, but keep in mind the amount of memory that the router has to spare for this log. In order to clear the EIGRP event log, enter the clear ip eigrp events command. Caution: When you enable eigrp event-logging, it prints the event logging and stores it in the event table. This can lead to a large amount of printed output on the console, similar to when heavy EIGRP debugging is enabled. 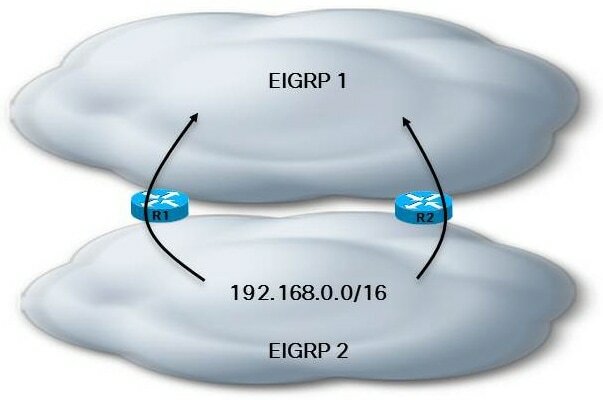 If a route is learned via two EIGRP processes, then only one of the EIGRP processes can install the route in the RIB. The process with the lowest administrative distance installs the route. If the administrative distance is the same, then the process with the lowest metric installs the route. If the metric is the same as well, then the EIGRP process with the lowest EIGRP process ID install the route in the RIB. The topology table of the other EIGRP process will have the route installed with zero successors and an infinite FD value.